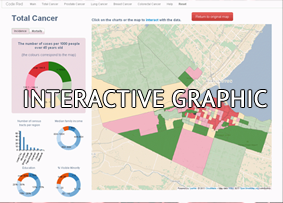 Posted Tuesday, May 21, 2013 6:17 PM EDT by HAMILTON SPECTATOR & filed under Barton St.. It was a drive-by decision made on the spur of the moment. In hindsight, Lou Di Leonardo admits, maybe it wasn’t the best way to buy property. It was spring 2006, and Di Leonardo, a home builder who lives in Smithville, was driving along Barton Street on his way to Hamilton General Hospital. He saw the abandoned, dilapidated building at 374 Barton St. E. and decided to buy it for $62,000 without even setting foot inside. “I don’t know, maybe I have a warm spot for Hamilton, ” said Di Leonardo, who came to Canada with his parents at the age of four and grew up a couple of blocks from Barton near St. Ann’s church. It certainly wasn’t love at first sight. There was – and still is – nothing to love about 374 Barton from the outside. And there’s certainly no inner beauty, either. When he eventually did rip the boards from the exterior, “it was a real eye-opener,” whistled Di Leonardo. For one thing, he discovered the building had been subdivided into 13 apartments – “little cubby holes, not nice, ” – more than double the number of units allowed for that building. Parts of the building were burned out. Someone had stolen the electrical panel while the wires were still live – he still doesn’t understand how the vacant building he bought could have had live electricity running through it. Upstairs, there were needles lying around. “You could tell a lot of vagrant people were going in there to keep warm. “A week after the deal closed, I went in to the building department and the planning department and I said I want to renovate it, clean it up and I wanted to do it all on board and legal, ” Di Leonardo added. Seven years later, 374 Barton remains a vacant eyesore. Di Leonardo says he’s spent nearly as much on fees, charges, planning and architects as he did to buy the property, and still hasn’t started renovations because of what he describes as a forest of red tape he’s been forced to cut through. “You should call my wife or my brother and ask them how pissed I’ve been with the ordeal on Barton Street on a scale of one to 10, and they’ll say 20, ” said Di Leonardo. 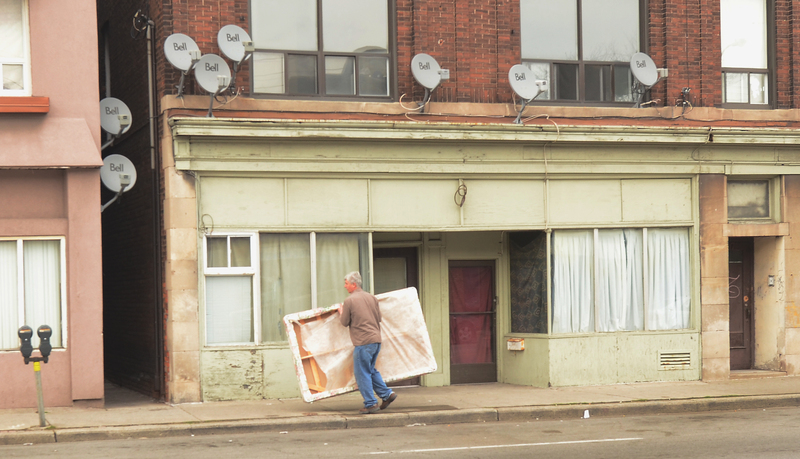 The story of 374 Barton illustrates some key issues that affect the Ward 3 portion of the street, particularly those related to the delicate relationship between commercial storefronts and housing. There’s also the question of the role played by the city when it comes to issues such as zoning, building and property standards. There are now more than 50 ground-level storefronts that have been converted to residential apartment units along the Ward 3 portion of Barton Street. Nearly half the storefront apartments are along Barton from Wellington to Wentworth streets. On the north side of Barton between HamiltonGeneralHospital and Wentworth Street, nearly one in three addresses is a ground-level storefront converted to apartments. Much of the Ward 3 portion of Barton Street East is zoned H, which allows for commercial and community shopping uses. That made sense half a century ago, before malls and big-box stores, when small shops on busy streets were a way of life. But when the retail opportunities dried up, people began moving into the empty storefronts. Some of the properties were never meant for habitation and lack proper facilities, such as kitchens and bathrooms and plumbing. For landlords, it was a chance to recoup some money from an empty shop. For tenants, many with limited means, it was a cheap place to live where few questions were asked. The issue is a concern for the Barton Village Business Improvement Area, which helps support merchants between Ferguson and Sherman avenues. Shelly Wonch, executive director of the BIA, has been working with police and the city’s economic development department to find ways to change zoning and standards. “We need to strengthen some of our bylaws and we need to find a way to get those places renovated and rented to commercial spaces, whatever they’re zoned for, ” said Wonch. According to the city’s planning codes, areas with an H zoning designation are not permitted to have residential units on the ground floor. Glyn Wide, Hamilton’s head of bylaw enforcement, said the city conducts blitzes, but often the biggest challenge is simply gaining access to verify the space is being used illegally as a residence. “It requires the people living there to let us in and not always do they want to let us in, ” said Wide. “I do understand that some people get cheap rent and they’re content to be living in the storefront and they don’t want any involvement from bylaw, ” Wide added. “On the other hand, we have to make sure the conditions they’re living in are safe and secure and they have some standard of living. 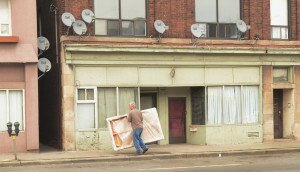 “Barb” is one of the people living in a storefront apartment on Barton. She asked that her real name not be used in order to avoid repercussions, even though she thinks highly of the building’s owner. “They’re good people, they’re down to earth,” said Barb. Her home is a former street-level shop near the hospital. The front window is covered with a bedsheet and an old sleeping bag, and her living quarters consists of a small room with a television, radiator, futon and a small table with a computer. Down the hall, there’s a kitchen and a bathroom shared with another ground-floor tenant. Barb ended up in a storefront because her last apartment was infested with bedbugs and cockroaches and she needed an inexpensive place to live in a hurry. A Barton storefront apartment can be rented for less than $600 a month in some cases. On this day, Barb’s brother has stopped by to check on her. He said he used to live on Barton Street and he’d turn off the television, open the front curtains and just watch life unfold on the street. “You don’t need TV when you live on Barton Street, ” he said. He describes one nearby building notorious for housing prostitutes in the back. He recalled a time he watched one of the prostitutes give birth on a couch in the house during the day – she was out working the street that same night. The quality of tenants in her building has declined in the past year, Barb said. Most of them are some combination of young, unemployed, living on Ontario Works or disability payments and in need of cheap accommodations. Barb was hopeful when a new restaurant opened in a nearby cluster of renovated storefronts, “but that didn’t last long, ” she added. And the new ice cream parlour a couple of doors down from the failed restaurant? “I feel sorry for her because she’s not going to last because of the area,” said Barb. A few doors down live Kathy and Corey, who agreed to speak on the condition their last names not be used. They live in a mustard-coloured building that spans 379-383 Barton St. E. Like Barb, they needed a place to live quickly and this one didn’t require first and last month’s rent. They started in one of the storefront units, which rented for $575 per month, but Corey said he noticed problems right away. The couple then moved upstairs to a second-floor two-bedroom unit that rents for $625 per month. At the time of the interview in late winter, they claimed the apartment was infested with bedbugs, cockroaches and mice. “We don’t sleep with the lights out, ” said Kathy. “You can hear the mice in the stove vent all night long, ” added Corey. Andy Walczak has owned the buildings at 379-383 Barton for a year. Over a coffee with his property manager, Shakeel Hanif, Walczak offers another side of the story. He says in the year he has owned the buildings, he has spent $150,000 in renovations – everything from new floors, new kitchens and new bathrooms to a new furnace when he discovered that four units hadn’t been getting heat. He said he’s also addressed the bedbug problem, which is a common complaint at other Barton addresses and throughout Hamilton. Both Walczak and Hanif said it’s incredibly challenging to find good tenants for Barton Street properties, in part because of the street’s bad reputation. They describe an incident from a week earlier, when Hanif received a call at 4 a.m. They said they even have to monitor the mailboxes because people will just use the address to receive a social assistance cheque. “It just seems the quality of tenant is not as high as other areas, ” said Walczak, who owns other rental properties in Hamilton. There are few people who would dispute the ugliness of 374 Barton, including its owner. “It’s crap,” said Di Leonardo. In addition to building and renovating homes, mostly in Niagara, he’s also a town councillor for West Lincoln. Given the state of his Barton Street property, it’s a sensitive subject for Di Leonardo, who takes pains to stress his political role is separate from his job as a builder. Di Leonardo rhymes off the obstacles he says he’s faced in his attempts to rehabilitate 374 Barton. He wanted to knock it down and start over, but was told if the building were demolished, it would lose its legal nonconforming status to have six residential units on the upper floors – notwithstanding Di Leonardo’s claim that the property had previously been subdivided into 13 residential units. If he didn’t want to start the process from scratch, he would have to keep the so-called “footprint, ” which means using much of the original hideous structure. Di Leonardo’s idea was to create four wheelchair-accessible residential units at street level and six apartments upstairs. He was told he was required to have commercial space on the ground floor. That’s when his blood started to boil. All around that part of Barton Street, there are vacant storefronts or storefronts that have been converted into apartments. He said there’s no chance he’ll rent out his renovated commercial space. “Who the hell wants to rent it there?” said Di Leonardo. “It’s going to be 2,500 square feet of nothing. He continues rattling off the barriers. He didn’t have enough parking to support the residential units, even though he discovered 13 units inside when he opened it up. He needed to get affidavits from neighbours. He had to agree to reline the sewer from the street even though he had an engineer’s report stating it was fine. He was told to conduct a noise study. Di Leonardo registered his property with the city’s vacant building program, at a cost of $614 per year plus a one-time $246 administration fee. He was then told to put a sign, front and centre, on his building, with his name and phone number. “So now it’s Lou Di Leonardo, the slumlord, ” he sighed. Not long after, Di Leonardo discovered almost by accident that he was facing potential fines for ignoring orders to comply issued by the city. Even though the property was registered as vacant, he said, the city was stapling the orders to the front of the building, where they’d get ripped off by passersby, instead of sending the orders to his home address. Di Leonardo isn’t the only Barton Street property owner who’s made that complaint. 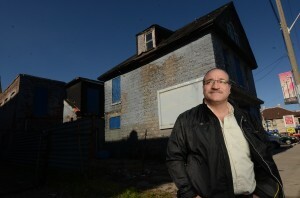 Steve Pocrnic, a real estate developer who co-owns a registered vacant building at 659 Barton St. E., said an order was posted on his property’s front door about garbage dumped illegally at the back of the building. “They know it’s a registered building, they know we don’t live here, they know it’s empty and yet they leave the notice there, ” said Pocrnic, shaking his head. City building and planning officials dispute some of Di Leonardo’s contentions. They say his building permit application was reviewed within the required period and he was notified of deficiencies. The city also waived the requirement for a noise study. Prior to Di Leonardo’s submission, the city met with him and considered four alternative redevelopment concepts he proposed for the property. During that process, staff identified the zoning and engineering issues, as well as the various fees, studies, requirements, reports and other background items for each of the four options being proposed. The city determined that six upper apartment units were permitted, but, because of the H zoning, no street-level units would be allowed. VanderWindt also noted the city’s building and planning regulations are intended to be prescriptive, not punitive. Maintaining the legitimate uses of a property can also be a stepping-stone to help owners modify the uses of a property in the future, VanderWindt noted. Di Leonardo has put off plans to buy another building in Hamilton’s downtown because of his Barton Street experience. “I will not be spending another dime in this municipality to do any of that work because of the red tape you have to go through to get from point A to point B, ” said Di Leonardo. It’s Valentine’s Day on Barton Street. It’s hard to tell if love is in the air, but offers of short-term companionship are certainly for sale on a couple of street corners. 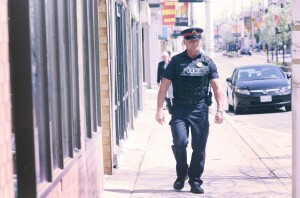 Hamilton Police Constable Dale Neil steps out of the cold and into a corner pizza shop in the middle of the afternoon. Less than half an hour earlier inside the same store, a young woman had asked Neil for a couple of bucks. “I won’t give them money,” he said. Instead, he bought her a slice and a can of pop. Now she’s passed out face down on the table, the pizza half-eaten and the can of pop toppled on its side. The temperature hovers around zero and all she’s wearing is a thin short-sleeved shirt that’s riding high up her back and stretchy pants that are riding low. Neil tries to rouse her, but the best he gets is a couple of garbled growls as she takes a half-hearted swing at him. He decides the best bet is to call an ambulance. Within minutes, there’s a fire truck, an ambulance and seven police and emergency services personnel crammed into the pizza shop, trying to figure out how to get the young woman onto a stretcher. Once she’s been taken to hospital, Neil resumes his foot patrol. “This is what you sign up for right from day one, ” said Neil. “For the most part it just happens right in front of you. For seven years, Monday to Friday, 9 to 5, Barton Street has been Neil’s workplace, from the Wesley Centre on Ferguson Avenue down to Wentworth Street to the east. 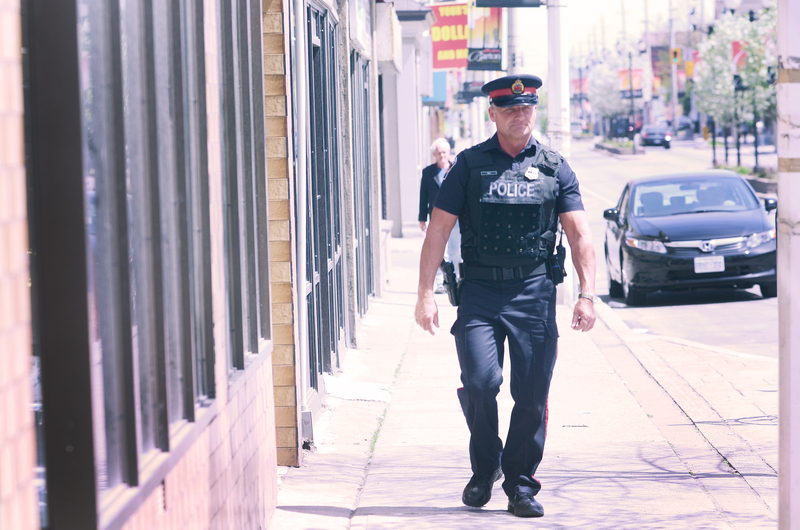 Most of his time, though, is spent in the few blocks between Victoria Avenue and Emerald Street, where there’s a higher concentration of residents and small businesses. “There’s just something about being on foot, being right there, ” said Neil. Neil can’t walk a few steps without someone stopping to chat with him. “I actually look forward to coming down here, ” Neil said. Drugs are the biggest problem, he said, but it’s not as blatant as it once was. Neil has been in Hamilton since 1990. He’s been mentioned in Sports Illustrated and the book of Guinness World Records for running the fastest-ever vertical mile – which essentially means up and down the stairs of a skyscraper. He’s a calm, low-key presence and believes being on the street during the day has helped improve his section of Barton. During the day, however, “they know I’m down here, they know how to contact me. “You get a lot of good people saying thank you every day. A lot of this stuff you can’t measure, but I know that it works, ” Neil said. 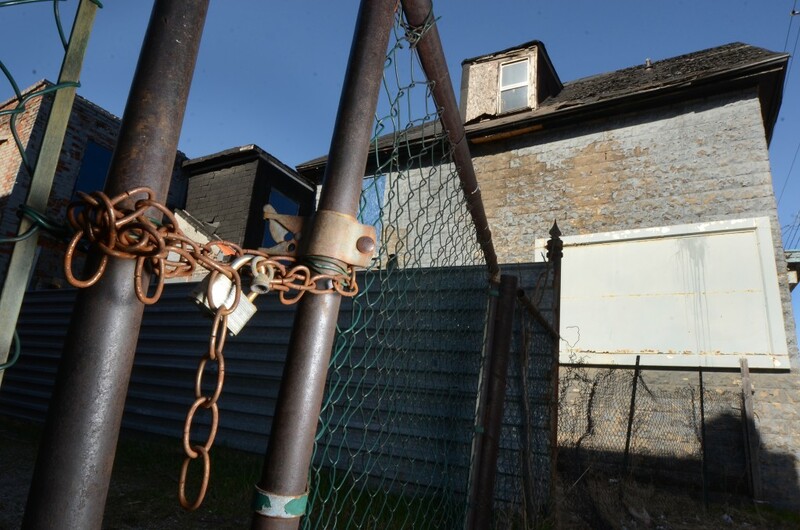 As with Lou Di Leonardo and his property at 374 Barton or Andy Walczak and 379-383 Barton, it would be easy to take one look at 309 Barton St. E. and come to a similar snap judgment about its owner. The building consists of three ratty street-level storefronts converted to apartments with bedsheets covering the windows, six units on the two upper floors and a thicket of satellite dishes jutting from the facade. Then Fred Sobie of Mississauga explains the challenges of being the landlord of 309 Barton, owned by his family since 1974. He’s soft-spoken and prone to long pauses before he provides thoughtful answers to difficult questions. At the time of the interview, Sobie said four of his 10 tenants had stopped paying rent. Two cases were being taken to Ontario’s Landlord and Tenant Board tribunal, one had skipped out and the other was moving. “They decided that they’re not paying, ” said Sobie. “They spent their money on something else. When his father bought the building, the street was still thriving commercially, Sobie said. By the 1980s, there was just one store operating in the building and Sobie’s father – with the city’s approval, he added – converted the other storefronts to residential units so he could bring in some revenue. He’d be happy to return his ground-floor units to commercial space, but there’s no interest, he said. He points to some renovated storefronts across the street that sit vacant save for one. Meanwhile, he said, he’s spent about $30,000 on renovations in the past year and would like to spend more. “We’re trying to bring it up, ” said Sobie. “I know visually from the front it doesn’t look that way. Sobie admits there are times he wonders if it’s worth the aggravation. His wife would love to see him sell the building. “But people need a place to live, ” Sobie said, “and I try to do my socially responsible part by providing an opportunity for tenants to see there’s an opportunity to do better and live better by giving them this apartment. “Unfortunately, I’m an optimist, ” he concluded with a sigh.